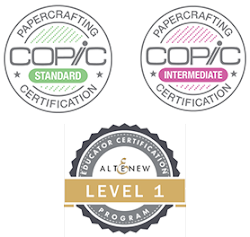 I am back again with another group of projects from my Altenew Educator Certification Program. The name of this class says it all: In the Mood for Color. It focuses on using different colors to convey the mood of the card. I chose pink ... BIG surprise! 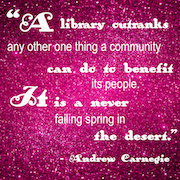 Pink inspires feelings of caring, sweetness, and sensitivity which are all wonderful reasons to send a card. I chose the Cherry Blossom set from Altenew for my pinks and the Tropical Forest set to stamp my leaves. These bright and cheerful combos are two of my favorites. 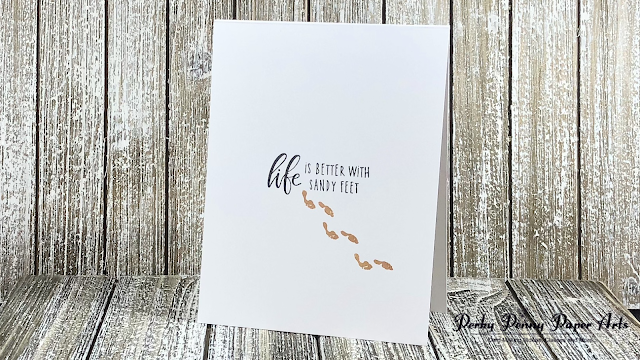 To prepare to make these cards, I created a couple of A2 backgrounds using the Altenew Classy Stripes Stencil in different ways. The first one I created using Nuvo Glimmer Paste, a piece of card stock, Pink Diamond ink, a craft mat, my stencil, and a spatula. This stencil is very easy to line up straight which I did and I attached it to my paper using Purple Tape. I then flipped it over and placed it on my craft mat. The Nuvo Glimmer Paste is the best I have ever used. It is light and airy, mixes quickly, spreads easily, and shines beautifully. I took my ink pad and smooshed some color onto my craft mat and then used my spatula to take some of the glimmer paste and mix it with the color to create a pretty, light pink glimmer paste. I then took the spatula and applied the mixed paste to my card stock. I prefer to make smaller amounts rather than too much (= waste) so it took me three tries before my panel was complete. I washed up in between with a baby wipe so as not to muddy up the white paste in the jar. When I was finished applying the paste, I removed the stencil and took everything to be cleaned up right away. Another great attribute to this paste is that it dries very quickly but that means fast cleanup is essential. The second background was created using the stencil and two inks, Pink Diamond and Bamboo. I attached the stencil to the paper and sponged the pink horizontally. Then I removed and cleaned up my stencil and reattached it -- vertically this time. Sponged in green. I love the pretty checkered pattern this created. 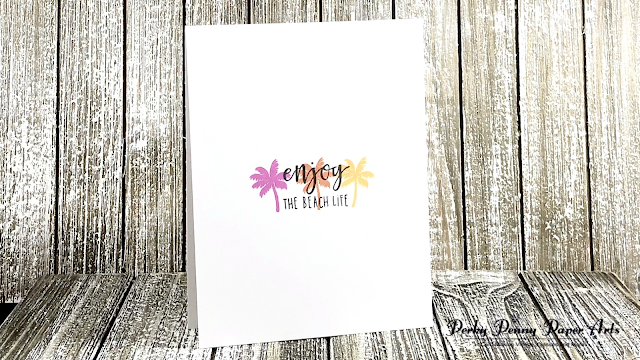 The last way I used this versatile stencil was by embossing it on card stock with my die cutting machine. The result was a beautiful panel that would line up with the stripes of the frame I cut out beautifully. Check out the video to see this in action. When my glitter piece was dry, I took that and the sponged background and die cut an oval frame out of each of them. This made three pieces that I could now create cards with. 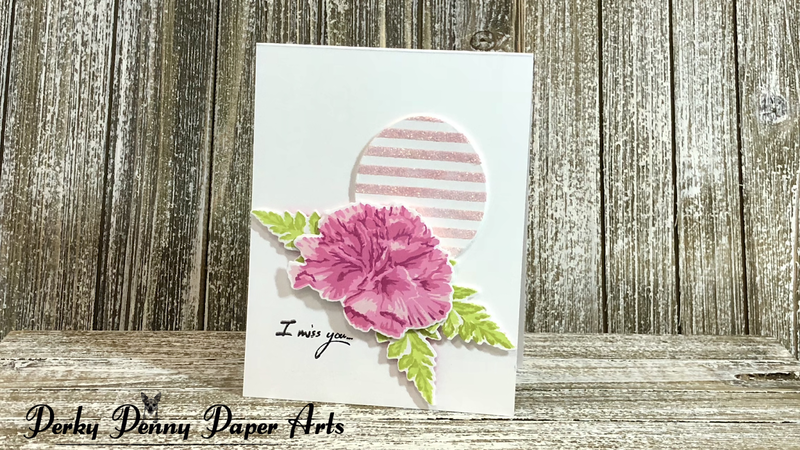 In continuing my preparation for creating these cards, I stamped and die cut a number of the carnations in the Cherry Blossom colors and the leaves in the Tropical Forest set. 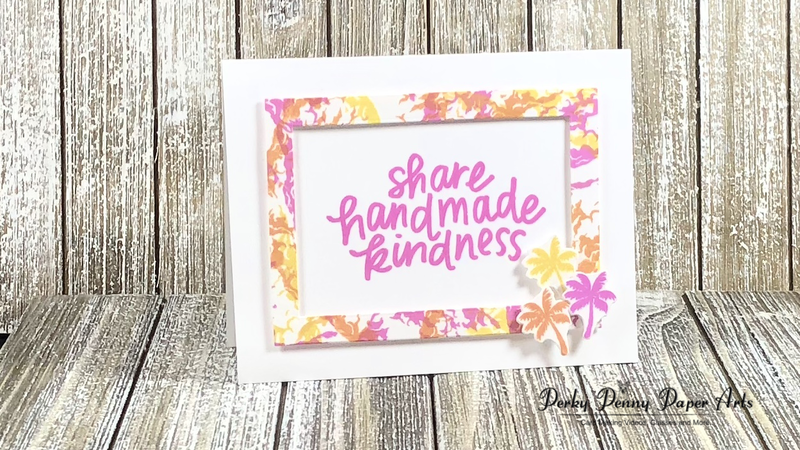 I also stamped and cut one of the frames from the Framed stamp and die set in Pinkalicious and die cut 15 of the frames in white card stock. 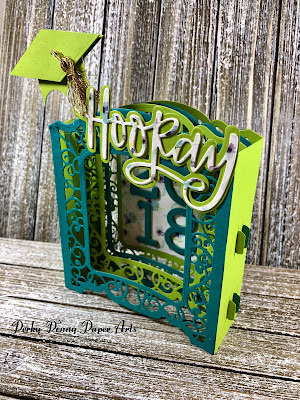 I stamped sentiments on the center ovals that were die cut when I cut the frames. I experimented creating this background by using my scoreboard and bone folder to score every quarter inch vertically and horizontally. This technique created a very subtle background that complemented the checked paper. And there you have it: one stencil used in three different ways on five cards. 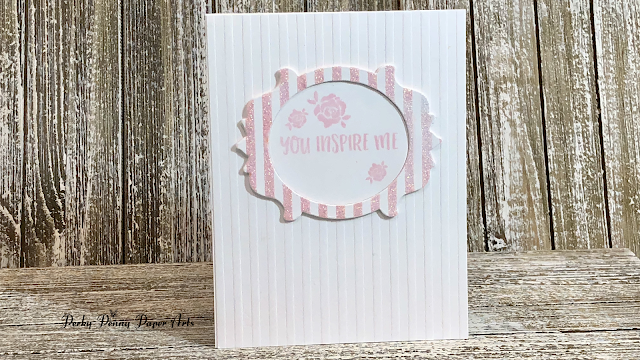 I hope you are inspired to play with your stencils, the beautiful Nuvo Glimmer Paste, and your inks to create your own pretty pink cards. Today we will be playing with the beautiful stamps from the My Monthly Hero Card Kit for June 2018. Unfortunately this kit has sold out but the ideas below can be translated to many different stamp sets and inks. My motto is "always think outside of the box." 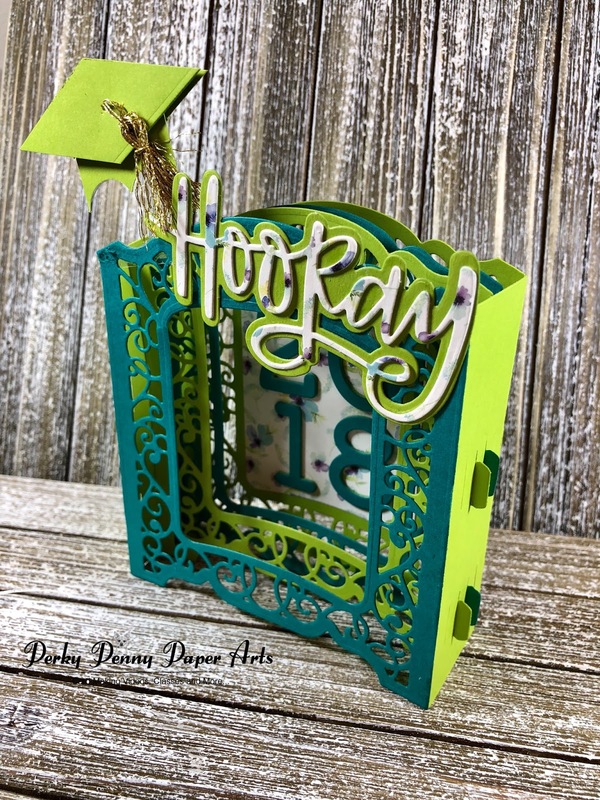 Check out the video below and read this blog post to see how I was able to take this kit in several unique directions. First let me introduce you to the pallet of Hero Arts ink colors I chose to stamp with today as seen in a trio of rainbow cards that start us off. 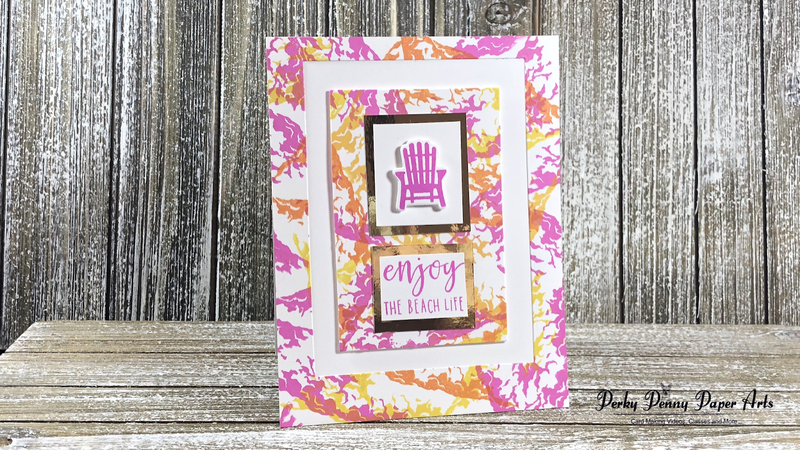 For the first card, I stamped each of the little Adirondack chairs in Neon Pink, Tangerine, Lemon Yellow, Neon Green, Deep Ocean (from the kit), and Orchid. I then die cut them and placed foam squares on each one. I took my top folding card base and placed it in my MISTI using my acetate grid to determine the placement of my sentiment. I then stamped the sentiment in Soft Granite ink from the kit. 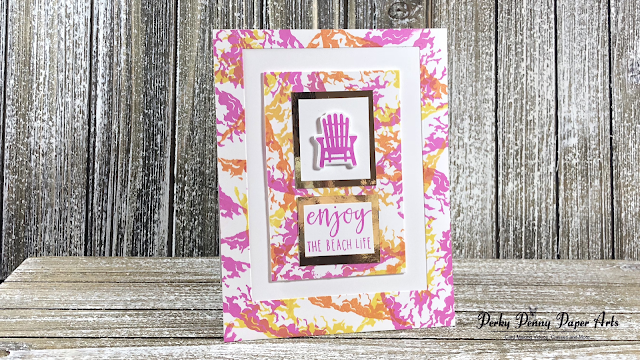 I know this is a light color for a sentiment but I really wanted the rainbow of chairs to be the main focus of my card. I then took my MISTI ruler from the MISTI Creative Corners kit and used it to line up the chairs evenly across my card. After attaching the chairs, this card is done. It really turned out the way I wanted. It is all about those adorable chairs. Continuing with the rainbow theme, I used second hand stamping to create the layered effect for these beautiful clouds. I am obsessed with these clouds as you will see in a few other cards. They are incredibly versatile, used together or alone. For the light color, I inked up the cloud and stamped off once on scratch paper. I then stamped on the card stock. The detail stamp is the same ink in its full strength. 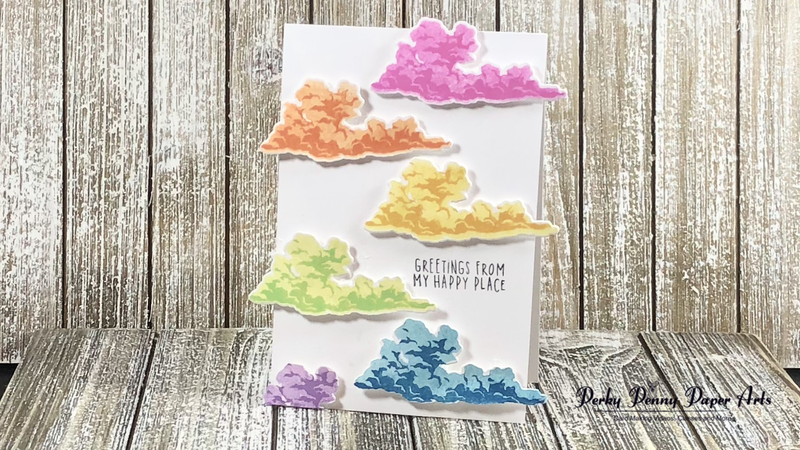 I repeated the process for each of my rainbow colors and die cut my clouds. I trimmed the 4 1/4” side of a top folding vertical A2 card to 3 3/4” so that I could let the clouds hang over the side and it would still fit in the A2 envelope. After figuring out my placement, I stamped the sentiment in Versafine Onyx black ink and then attached each of the clouds with foam tape for dimension. The only trimming I did was on the bottom purple cloud. 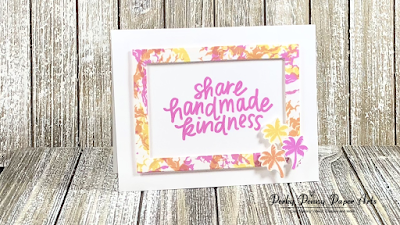 using the frame, a sentiment from the Acts of Kindness stamp set, and a grouping of palm trees from the kit and another using the 2 remaining frames, one of those adorable Adirondack chairs, and some pretty gold mirror mats to frame my sentiment and chair. 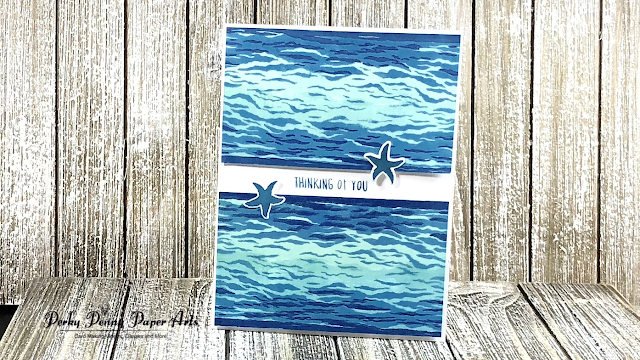 Now it was time to play with the Layering Ocean stamps. 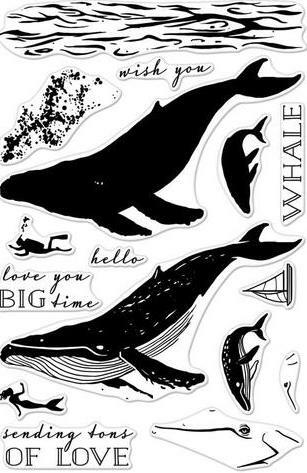 I'm an ocean girl at heart, having grown up in Sydney, Australia, so these stamps really speak to me. I wanted to think outside the box with this card. So I went with the Neon Pink, Lemon Yellow, and Tangerine inks once again. I stamped all three at the bottom of the page and then flipped the stamps and repeated the process upside down overlapping the first set. I then stamped a variety of clouds in Tangerine and Neon Pink. To create the sun, I masked off a circle and used the Lemon Yellow ink and a sponge. 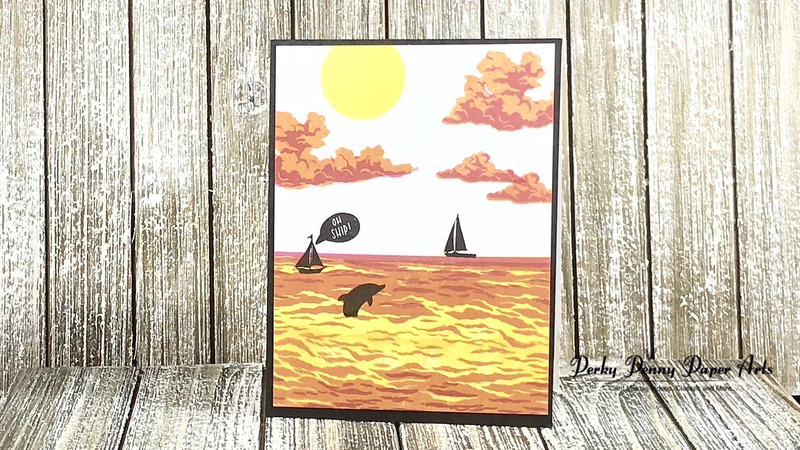 I stamped the Dolphin and Sailboat from the kit. I used a small piece of Washi tape to mask off the dolphin's tail so it looks like he is dancing in the water. The other Sailboat and “Oh Ship” stamps come from the Hero Arts Enjoy the Journey stamp set. I stamped the "I forgot your birthday" message inside the card to complete the sentiment. I trimmed my A2 stamped panel to 4” x 5 1/4” and matted it with a piece of black card stock to finish this card. 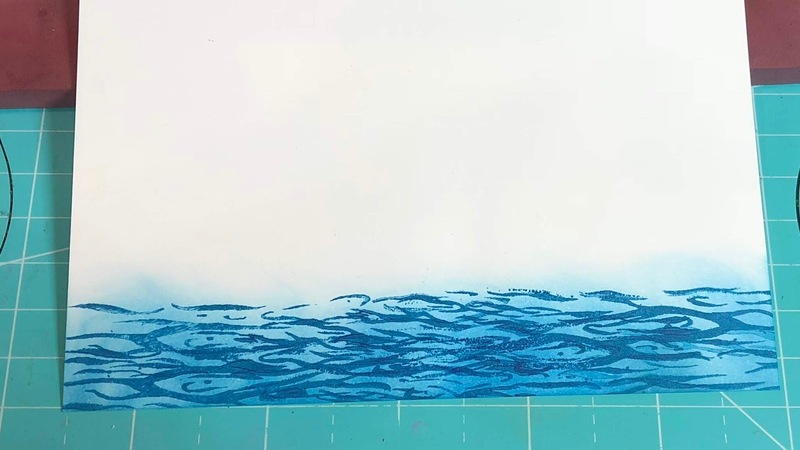 To create this next card, I used the same method as the ocean in my last card to create two identical panels. 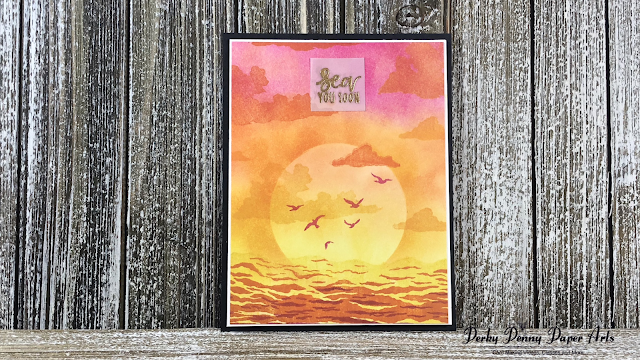 I stamped with the Deep Ocean, Summer Sky, and Soft Sky inks from the kit. After the two panels were stamped, I trimmed them down to 4 1/8" wide and then just above and below the dark blue line on the panels; in this instance they are both about 2 1/2" tall. I stamped the “Thinking of You” sentiment from the kit on the card base in Deep Ocean ink and secured the panels with foam tape. A simple decoration of two Starfish from the kit to highlight the sentiment was a wonderful finishing touch. And now for my favorite card from this kit so far. I have been playing with the new Nuvo blending sponges and thought this would be another awesome way to create with them. I have a sponge dedicated to each of the color families and another for when I am blending multiple colors together. I placed a 4 1/4” x 5 1/2” panel of Bristol smooth card stock on my craft mat and started my blending with the Neon Pink ink. I start off the page and then move on very lightly, patiently building up my color. I then moved to the Tangerine and the Lemon Yellow. Working down to where the ocean will be, I use the blending sponge in between each layer and over the Neon Pink at the top to create more whimsy in the sky. I then stamped the Ocean on the bottom. After I am done with this first layer, I take a large circle mask and apply it, centered towards the bottom of the card, just below the “water line.” I then sponge around the circle, except for the part under the water, first with a generous amount of Lemon Yellow, and then a small amount of Tangerine. The magic happens when mask is removed to reveal the beautiful sun. 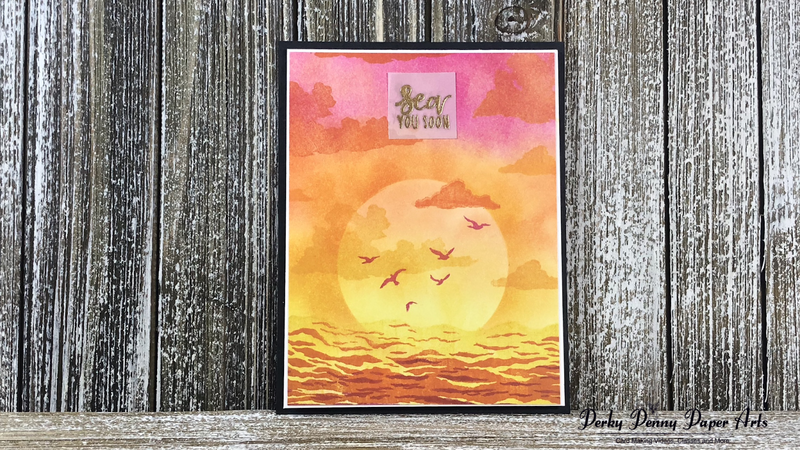 The third layer of this card consists of the Flock of Birds stamped in Neon Pink over the sun, and the solid clouds stamped around and over the sun in a variety of the three ink colors (Neon Pink, Lemon Yellow, and Tangerine). 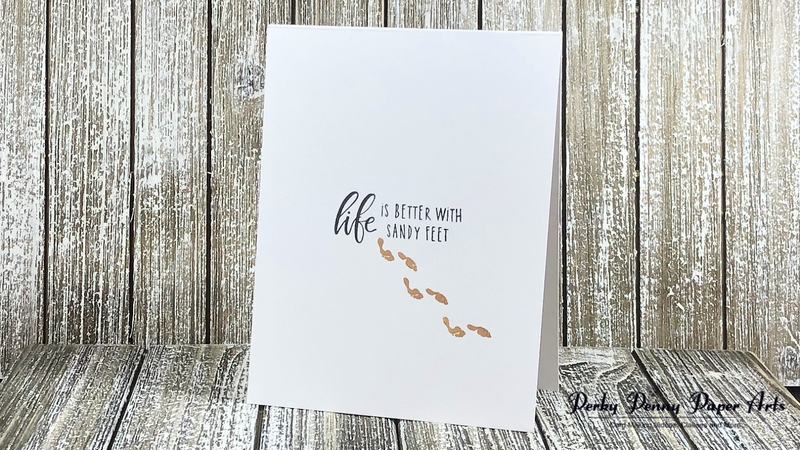 I stamped and embossed the sentiment on some vellum paper in gold and trimmed it down to fit on the front of my card. I decided to play around with this card design a bit to make it fun and unexpected. I wanted a thin white border to frame the decorated panel over an A2 sized black mat. I switched it up by making a 4" x 5 1/4" top folding vertical card and trimmed the decorated panel down to 3 7/8" x 5 1/8" to allow for my thin white border. I then attached the completed card onto the black mat which became the back of the card. This stamp set was wonderful for making incredible clean and simple cards. I like to make these every now and again because it reminds me that card making doesn't have to be time consuming. 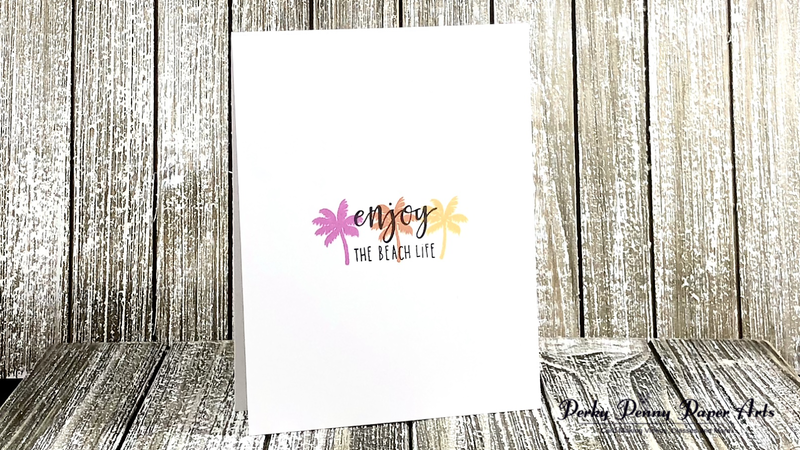 You can make wonderful cards in minutes with just ink, stamp, and the right paper. These are always good to have on hand. Ink colors: Versafine Onyx Black and Hero Arts Soft Granite. Versafine Onyx Black and Hero Arts Neon Pink, Tangerine, and Lemon Yellow. So there you have it. Me thinking outside the box. 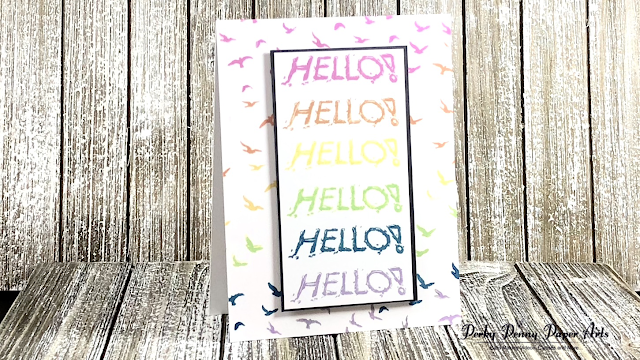 I created cards using a rainbow color theme; a piece of patterned paper created with one stamp and three ink; the ocean by stamping in different colors; and quick and simple cards with just stamps and ink; I used the ocean for something other than the ocean; and I did lots and lots of sponging. Which card is your favorite? 1 - 4” x 10” piece scored and folded in half to create a 4” x 5” card. Using foam tape align and adhere drawers to the front of the card and the 1/2” x 4 1/2” as the table top. Glue three pieces of silver that are of equal size (mine were 1/2” x 1/4”) to the fronts of the drawers for handles. Die cut the tools from the yellow and silver card stock. Cut and paper piece the handles. Align and attached tools to front of card. Glue a white circle in the middle of each of the black circles to create wheels and attach to the bottom of the card on the back side of both panels. Make sure they line up evenly. 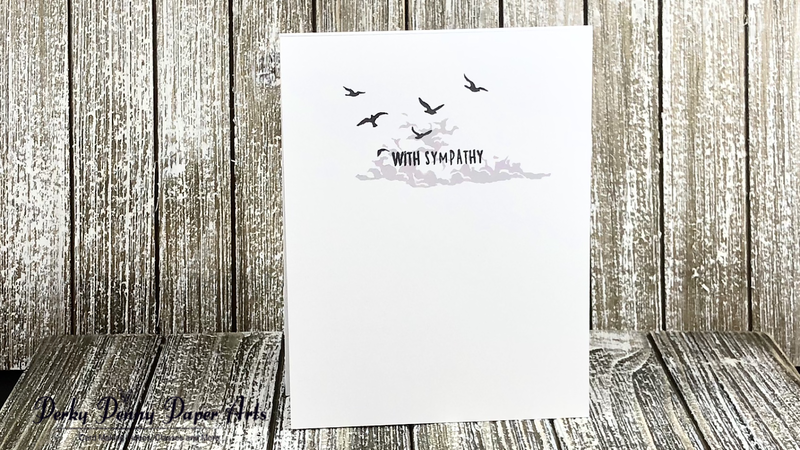 Stamp your sentiment on the inside of the card. Take patterned paper and position it vertically and score 3/4” from top of paper. Measure on score line 1" from either side and carefully cut with scissors from the edge to 1". This will create two flaps on the top of your paper. Fold each flap towards the center of the score line and fold to create the color. Take a 1/4” x 1 1/2” sliver of the collar pattern and place at the center of the score line to suggest a polo shirt. Attach your shirt to the card base and decorate as you like. There are 2 versions of this card I discuss in the video. This simple version which is made using a piece of double sided 12" x 12" patterned paper. Make sure that patterns look good no matter which way the paper is turned. 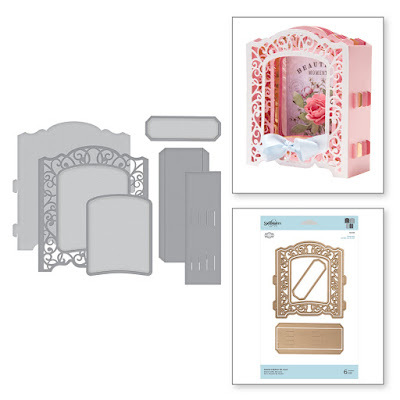 Use the card stock dimensions in the list below and follow steps 1 through 4. 1 - 2 3/4” x 4” for on top of the gift card pocket. 1 - 1/2” (or so) x 4” for above the gift card pocket. Take largest piece and make a cross by scoring on one side at 4 1/4” and the other side at 3”. Score and fold the 3” fold first and keep it folded while folding the 4 1/4” fold. Cut a slight V at the 4 1/4" score line on the 3" flap to make the fold easier. Open the paper up and apply 1/8” or 1/4” Scor-tape to the 3” sides and fold up to adhere to the 4" side to create the start of your wallet. Apply Scor-tape to the two 2” sides of the smaller piece of card stock and one longer side that you would like at the bottom and attach to the bottom right of the folded wallet to create your gift card pocket. Use the various pieces of patterned paper to decorate the outside and inside of the wallet. This is not necessary. If you would prefer, you could decorate it with stamps, stencils, or embossing folders. They sky's the limit! Decorate the “bill” card (the 7 1/2” x 3 1/4” piece of card stock) as you like and insert into wallet. Fold and score card base. 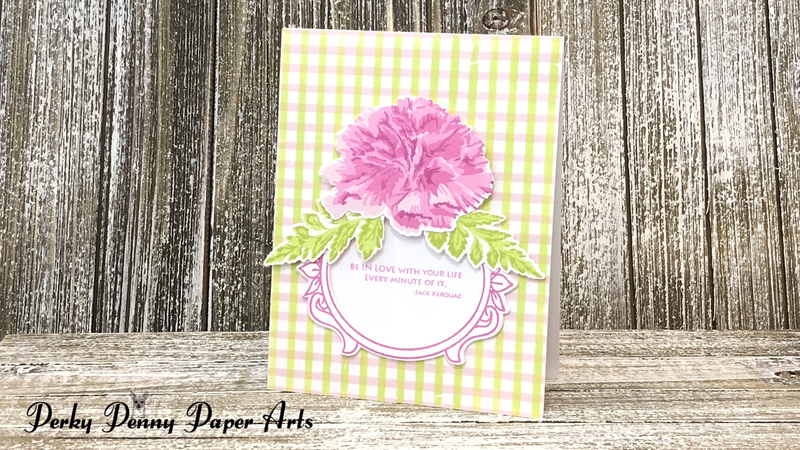 Adhere patterned paper to the front of the card. Stamp and heat emboss your sentiment on vellum. I used the large Hooray on the outside and an accompanying saying on the inside. Put glue behind the word on the vellum and attach to the center of the card front. A thought: the word on vellum would be great to dress up a simple gift bag or box. Great to just make a bunch of them to have on hand for cards or gift bags as you need them.